This article is part of a series called How to Write a Resume. To start this series from the beginning, read the introduction. Does your resume sizzle with the right keywords to get you noticed? Can your resume make it past the “reject pile”, get found in a crowded search database, or inspire a job interview? If you’re sitting by the phone waiting for a hiring manager to call, then perhaps it’s time to add the right keywords to your resume. In the previous article we squawked about how action verbs show hiring managers what actions you’ve taken in previous jobs. Where action verbs activate your resume, keywords are the nouns that explain to hiring managers what things you performed the actions on. Employers want to know the skills and qualifications you offer – so explain WHAT skills you possess with the right keywords and get yourself onto the hiring manager’s job interview list. Employers use keywords to filter through piles of resumes on their desk. If your resume is handed to them without the keywords that match job requirements, then your application may hit the “reject pile” without a second glace. To find job candidates, some employers use software programs, internet job boards, and resume databases to search for those applications matching the keywords they target. Other employers are so overwhelmed by the mass number of resumes they receive daily that they streamline their hiring process by digitizing resumes, storing them in a database, searching for ideal candidates using keywords, and then using the results to create an interview call list. In today’s world of keywords and search engine technology, if your resume doesn’t contain the right mix of job-specific keywords, then your resume may stay buried in the digital dungeon that is a candidate database even if you’re fully qualified for the job. As a job-seeker, using the right keywords on your resume is essential if you want your resume to leap out of a pile or be found in a database and land a job interview. A great place to get keyed into your resume keywords is to review 5 to 10 employment ads with similar job titles in your field and see which words are repeatedly mentioned. Once you see a pattern, highlight and list the keywords employers mention and be sure to include them in your resume and cover letter. If you’re still stuck narrowing down a list of skill and qualification keywords for your resume or cover letter, then try using the Occupational Information Network (O*NET) to learn about the standard descriptors specific to your occupation. 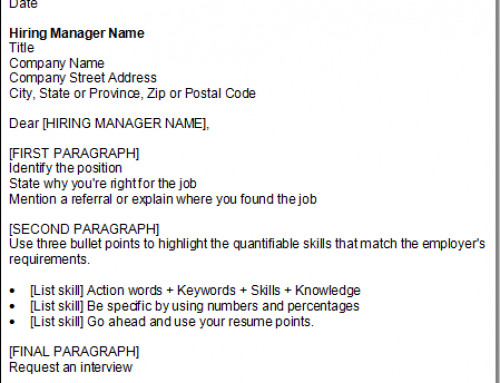 You’ve found and highlighted your keyword nouns, now put them into resume format! When writing your resume, it’s a good idea to precede your keywords with an action verb and then end each statement with specific facts and figures. This brings strength to your resume and sells your skills to a prospective employer. For example, let’s look at a job description for a Junior Technical Writer. 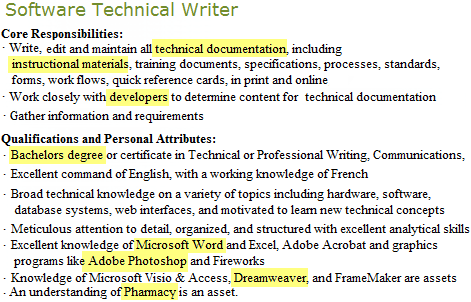 I’ve highlighted the 8 keywords that match the applicant’s skills best. 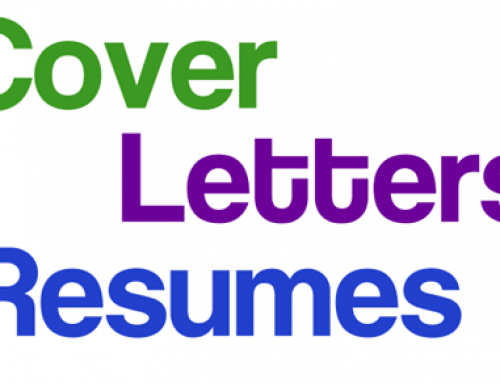 Now let’s get these 8 keywords working for us in resume format! Notice how I’ve put a few keywords in each sentence along with an action verb! Wrote technical documentation and instructional materials in French and English for an online pharmaceutical website. Worked in a team with software developers and pharmacists to design software specifications and web interfaces for a pharmacy database system. Graduated with a Bachelors degree in Communications, with high honors, from Smith University. 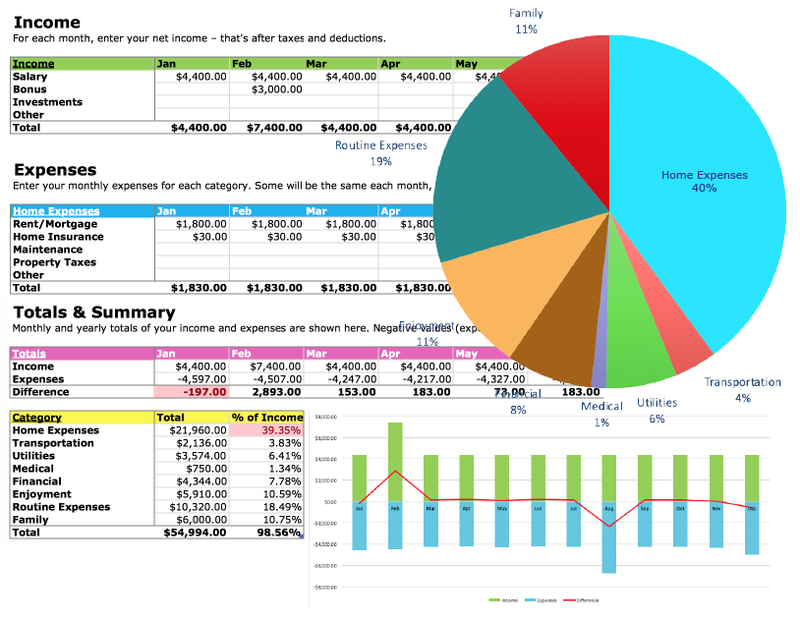 Wrote, edited, and maintained online help and user manuals using Microsoft Word, Adobe Photoshop, Dreamweaver, and created work flows with Microsoft Visio. Adding keywords to your resume not only sets your skills on fire but can get you noticed in a competitive job market. So go ahead and find your career keywords and land that job interview! 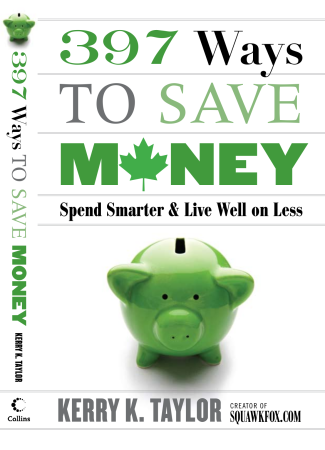 Thanks for more great tips in this excellent, timely series. Including the bonus words does create additional interest … maybe enough to get to the interview stage. When I skim thorough resumes, its the keywords that really do catch my eye and further peak my interest to follow up. 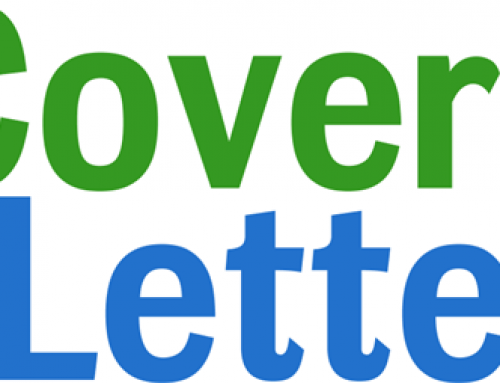 Some people send me essays with bland generic cover letters that are copies of internet samples…those get glossed over. The right keywords make all the difference. Good article for anyone trying to polish their resume! I don’t know…there may be good information on lachamba but I can’t confirm it. I went to the site and clicked on the behavioural interviews video. I think lachamba’s credibility suffers a bit when you hear a toddler talking away quite loudly in the background. First impressions mean a lot and I tuned out almost immediately. I’m applying for another job in just a couple weeks and will DEFINITELY be making use of your resume tips!! I love this series…keep it coming! I agree with everyone. Great series! I always forward your site to people I know who are struggling with the job hunt right now. While having key words on the resume is important, it is equally important to keep them in check- don’t put them on your resume just to have them. Use them if they are true! Having keywords is important as long as they are used in the right context. I see resumes all of the time and it truly cracks me up to see a job seeker who uses a thesaurus to find “keywords” and ends up using the word in the wrong context. Or they try to use keywords from a job posting without having any idea what they mean! 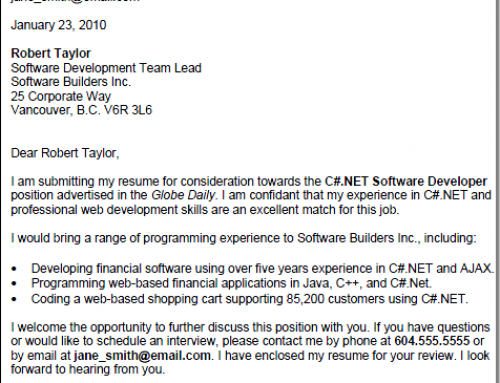 If you are job seeking, you should always try to run your resume by and impartial person! @NancyBeyond – When criticizing others you should “always try to run your [remarks] by and [sic] impartial person” as well or simply utilize basic proofreading skills (no thesaurus necessary). Remember – those who live in glass houses…..
An insightful and helpful article, thanks! To follow on from the theme of choosing words carefully, one’s interest is piqued, not peaked (in case this is a word chosen for your resume or cover letter). In the meantime I’m attempting to get a part time at least within the customer service role, in hospitality or tourism… Any help is appreciated in either career choice. Thanks for included the hint – and the link – for doing some research on the Occupational Information Network. REALLY good insight on finding keywords! These articles crack me up. So called experts giving their opinion on proper resume creation. Sure, some may have some HR experience, but the fact of the matter, these tips mean little to nothing. Everyday the rules are changed. Depending on your mood, resumes are not viewed the same way everyday. Your personal bias is the key factor in rejecting a resume. Are there some crappy resumes out in the world, hell yeah, but the majority of you are controlled by emotion while reviewing a resume. You so call experts lack common sense when reviewing resumes. I agree with Charlie. Resumes aren’t looked at like they used to. People are too lazy to read them. My company still reads them. They don’t look at them for 6 seconds and throw them aside. What can’t you possibly learn about someone in 6 seconds? Companies are cheating themselves out of great candidates. I think using keywords is useless. As long as they have the experience. That’s what should count.